Anything you hang from a wall—whether is is a simple family picture or large wall shelf unit—will require that the item is attached directly and firmly, with the weight safely distributed. The fastener you use will vary according to the weight of the object and the type of wall construction. Wall fasteners basically fall under lightweight and medium-heavy weight categories and hollow or solid wall designs. In this tutorial, we'll look at the different types of fasteners to use based on wall type and object weight. Type of wall: wallboard, plaster. The nailed picture hook is the most commonly used wall hanger due to its ease of use. When you simply place the hook flat against the wall, the nail naturally assumes a slanted position due to the shape of the hanger. Strike the nail short blows of a hammer, and the hook is installed. TIP: The trick with these little hangers is to make sure you locate the bottom of the hook at the proper location. Unlike just hitting a nail into a wall where you want the "hook," with these hangers, the nail is fastened higher than the hook location you want. TIP: When driving a picture hanger into plaster walls, use short blows of the hammer, and make sure your blows are straight, to avoid bending the nail. A variation of the single-nail picture hook is one that includes two or three nail anchors. They are rated to support weights up 75 pounds and will be best suited for plaster wall. 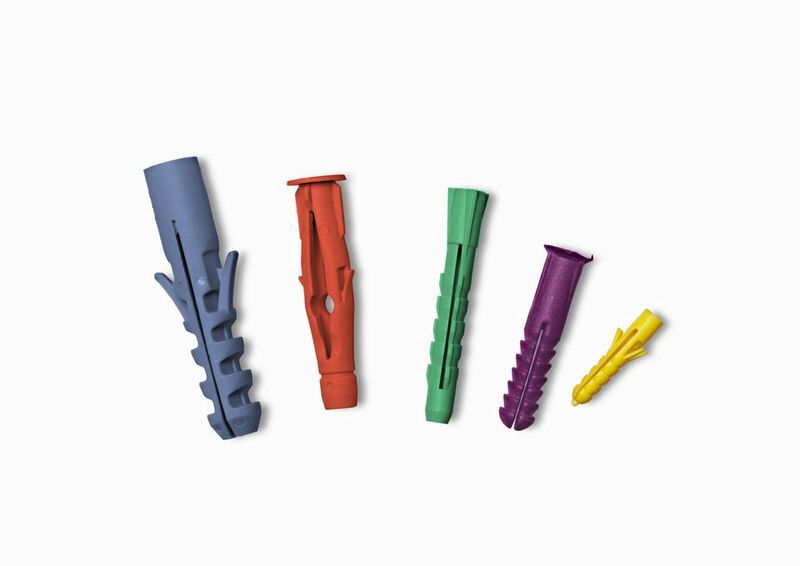 A relatively recent innovation is the self-tapping screw anchor, which can work very well for certain wallboard applications when they are installed correctly and used in their intended way. Wallboard walls can be difficult to anchor because picture hangers or nails can work their way loose. Self-tapping anchors avoid this with the use of an anchor sleeve with large threads that can securely grip the core of wallboard panels. Into this sleeve, anchoring screws are then driven with a screwdriver. In practice, it is easy to overtighten the anchors, leading to wall damage. To use these anchors properly, drive the anchors only until the face is flush with the wall, and resist the urge to overtighten them. Type of wall: hollow walls; wallboard, plaster. Weight rating: medium to heavy. These favorite workhorse anchors are strong (supporting as much as 75 pounds in 1/2" drywall, easy to install, and inexpensive. And when you eventually want to remove the hanger, all you do is loosen the screw and the plastic anchor straightens and can be pulled out—which can't be done with standard spring-loaded toggles. Drill a pilot hole in the wall sized as per instructions on the package (this depends on the toggle size). Fold the anchor's nylon wings together, and insert into the hole. Tap the toggle with a hammer until flush with the wall. Insert screw into the anchor's hole and tighten fully. These are the tried and true anchors for medium to heavy objects. These anchors have some drawbacks—specifically, they require very large pilot holes, and if you ever have to remove the bolt in the future, the spring-loaded anchor detaches and falls off into the wall cavity. Also, any kind of bracket you plan to attach to the anchor must be attached before the toggle bolt assembly is inserted into the wall. Drill a pilot hole in the wall sized as per instructions on the package (depends on toggle body size). Slide any fixture attachment you plan to anchor onto the bolt first. Thread the spring-loaded metal wings onto the bolt slightly so that the wings fold into toward the bolt head. Fold the metal wings together and insert into the hole. The spring-loaded metal wings will now snap open once they clear the back surface of the wallboard or plaster. Pull the bolt back toward you slightly so the expanded metal wings hit the back side of the wall. While maintaining pull pressure on the bolt, tighten it fully. Weight rating: medium- to heavy-weight. "Molly bolt" is the common name for an expandable metal wall anchor for hollow walls. These anchors work very well and are easier to use than toggle bolts. Many versions require that you drive a pilot hole through which to insert the anchor, but pointed versions are also sold that are simply driven into the wall with a hammer. Like toggles, these anchors are held in place by pressure on the back side of the wall. However, they do this by compressing expanded metal straps that are designed to buckle in a specific manner as the bolt tightens and compresses the umbrella closure. If using a pointed, self-starting anchor, drive the anchor into the wall by hitting it with a hammer and seating it firmly so the tooth prongs bite into the wall. If you have the type that is not pointed on the end, drill a pilot hole in the wall, sized as per instructions on the package (depends on anchor body size). Slide the anchor into the wall, and tap with a hammer to seat fully. Tighten the bolt, and draw the umbrella closure tight up against the back of the wall. Type of wall: plaster walls. Weight rating: light to medium. These anchors are often misused by people who try and use them in drywall applications. They're virtually useless in hollow wall applications such as drywall ​and are designed to expand against a solid surface as the screw is tightened. These anchors are inexpensive but work adequately if installed into plaster, masonry, or some other solid material. Also, when drilling pilot holes for these anchors, size the holes a little snug to create a tight, fit so the anchor does not spin drive screws into them. Drill a snug pilot hole. Tap the anchor into the hole using a hammer. Fasten the screw into the hole. This will force the plastic anchor to expand, tightening it securely against the solid surrounding material. Type of wall: masonry walls. Some masonry anchors use a plastic shield, as shown in the preceding page, while others use an anchor made out of lead, a soft metal. Whether fastening by a screw or lag bolt, the approach is the same. The screw or lag bolt will cut its threads into the soft lead metal and expand the anchor, pressing against the solid masonry for a secure hold. Drill a pilot hole in the masonry wall, sized slightly small to provide a snug fit. A specially designed masonry drill bit will be required to drill in concrete block or stone; expect this to take some time. Blow out the masonry dust from the hole, and, using a hammer, tap in the anchor. Fasten the screw or lag bolt into the anchor.